These Blue Cheese & Cracked Pepper will be a standout completely on their own, as a piquant and peppery snack. 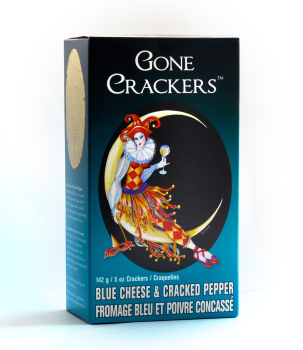 GONE CRACKERS suggests the Blue Cheese & Cracked Pepper cracker is, "great with a seafood pate, or fig tapenade. A simple dollop of cream cheese works fine too..."